When you’re on your tenth watermelon of the summer, you start to get reaaaally creative with different ways to use it! You’ll see a couple of watermelon recipes coming up on the blog for that very reason. The first of which, is this creamy watermelon chia seed pudding! 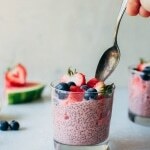 Creamy watermelon chia seed pudding? Sounds a little… strange, right? It sounded pretty strange to me at first, too. So strange that even though the recipe came out perfectly on my first round of testing, I had to make it two more times just to be sure that I wasn’t making up the fact that it was DELICIOUS. The base for the chia seed pudding starts by blending together fresh cut pieces of juicy watermelon, greek yogurt (Stay with me here. You can also sub in coconut yogurt for a dairy free option), lemon juice, and a little maple syrup to gently sweeten things up. 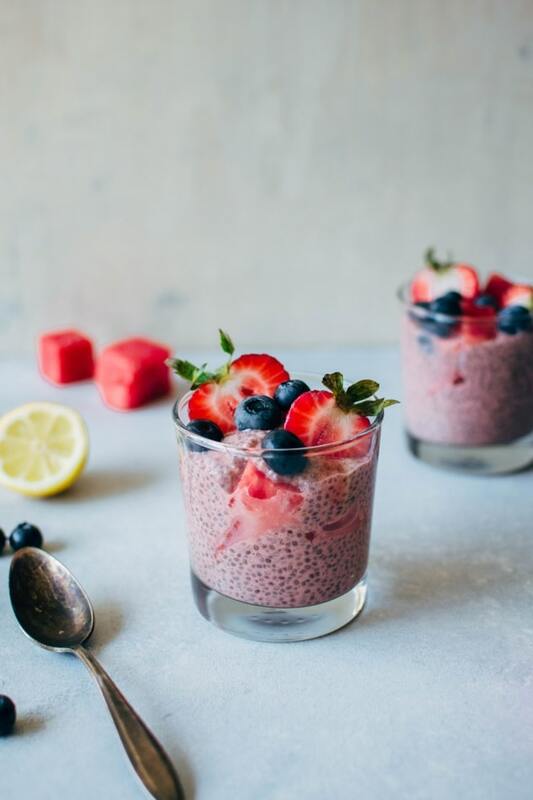 The chia seeds are whisked in, and once their plumped up, the pudding is layered into little cups with fresh berries, and more juicy watermelon. The result is slightly tangy, sweet, and loaded with juicy watermelon flavor that’s just begging to be eaten every summer morning. Or as the perfect sweet snack in the afternoon when you get that craving. And the best part of it all? It’s a healthy + lazy girl’s dream. Anyone else in this club? I mean, I work hard when I need to, but sometimes it’s just better to spend less than 5 minutes making something to eat. Perhaps it would be wise to replace the word “lazy” with “efficient”. That sounds a little better rolling off the tongue, don’t you think? Prep your base, whisk in the chia seeds, and leave it for a few hours or overnight to thicken. 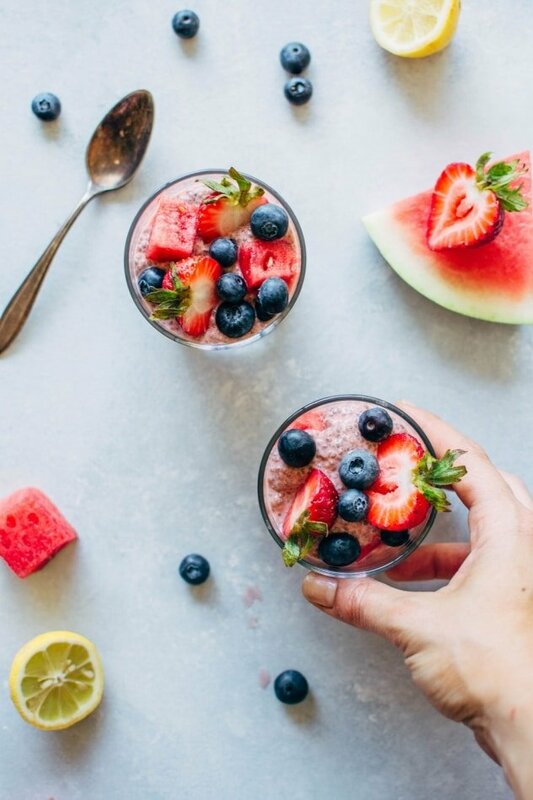 When it’s ready, layer it in a cup or your favorite bowl with some fresh berries + extra watermelon and you’re SET! Having things like this on hand in the refrigerator is especially helpful when you’re trying to eat healthier, and want to set yourself up for success. It’s much easier to make healthy choices when you have them already made and available to you! And besides being easy to make and super summery and delicious, this cup packs a powerful health punch! Packed with antioxidants! Naturally occurring compounds in plant based foods that help protect our bodies from free radicals, which can damage the molecules in our cells and encourage various diseases. High in vitamins and minerals – Magnesium, Manganese, calcium, and potassium just to name a few. Full of fiber which makes them great for our digestive health. 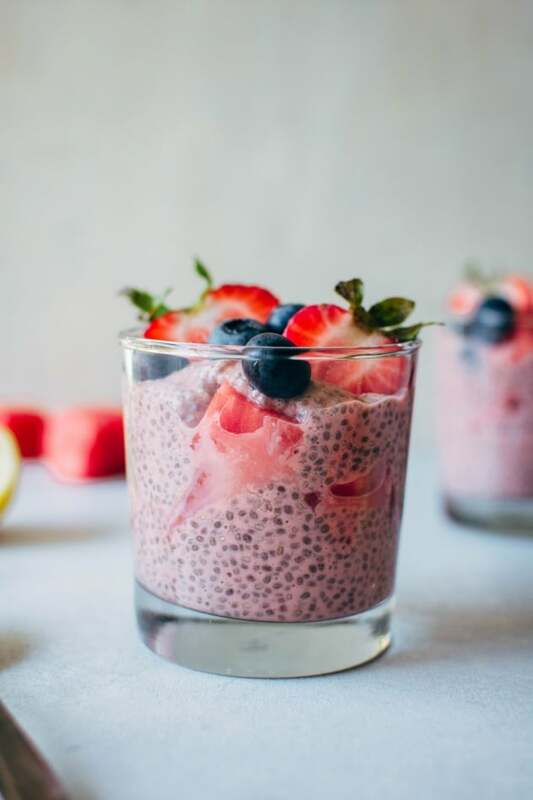 Besides their ability to keep us full longer, and promote healthy regularity, the soluble fiber in chia seeds acts as a prebiotic for healthy gut bacteria growth. Double win! Rich in omega-3 fatty acids – 2 tablespoons of chia seeds contain the same amount of these essential fatty acids as 4 oz of salmon! While made up of mostly water (duhh), watermelon actually boasts quite a few important nutrients as well. The second highest food source for Lycopene (guava comes in 1st, and cooked tomatoes come in 3rd), a carotenoid anti-oxidant that can help prevent cancer, promote heart health, and, if eaten regularly has even been shown to help reduce susceptibility to sunburn! WUT?! Food is so cool. Vitamins A, C and moderate amounts of potassium. A valuable amino acid called citrulline, which partially converts to arginine, another amino acid. Both help with cardiovascular health, blood flow and circulation. 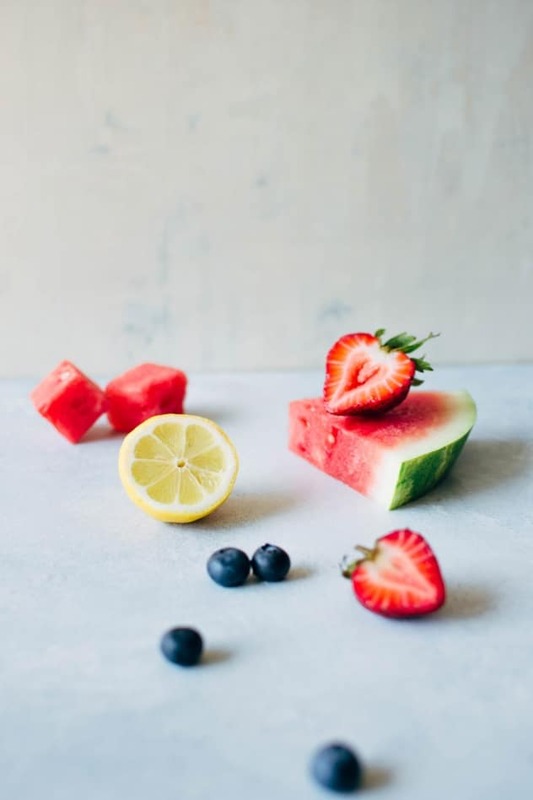 In order to get the maximum health benefits from your watermelon, allow them to ripen all the way (the darker the red color, the more anti-oxidants will be present!) and include the lighter, white-ish parts of the flesh that are close to the rind. That is where you’ll find the highest concentration of amino acids! 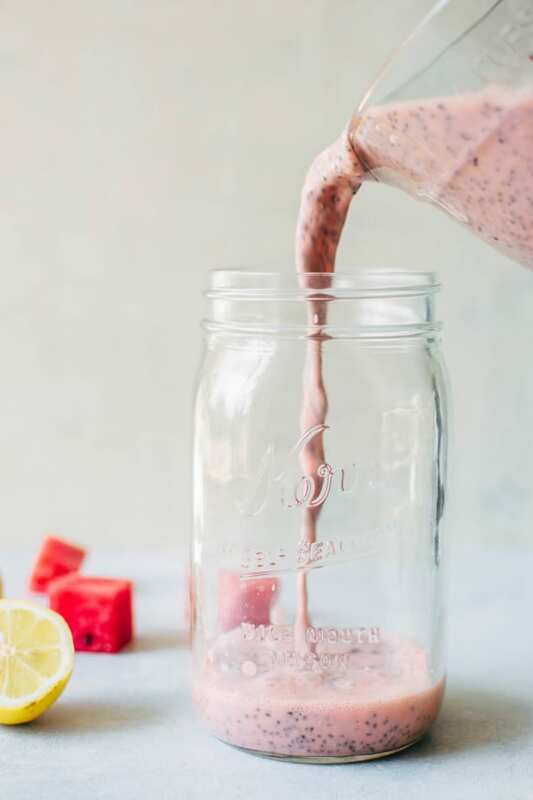 Blending your watermelon either for a chia seed pudding like this recipe, or into a smoothie or juice is a great way to include all (not just the sweetest) parts of the flesh. Want more easy grain free breakfast recipes? Check out these favorites! 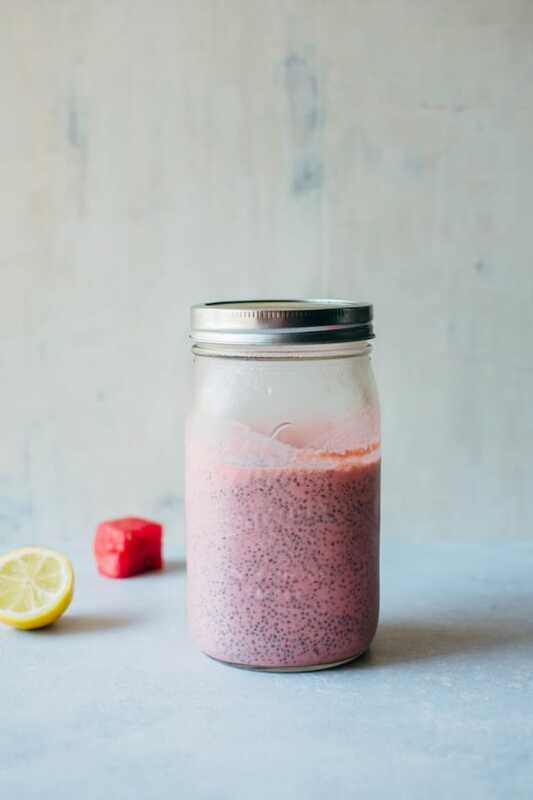 A simple and healthy recipe for creamy watermelon chia seed pudding made with minimal ingredients, and packed with juicy summertime flavor to keep you happy and healthy! 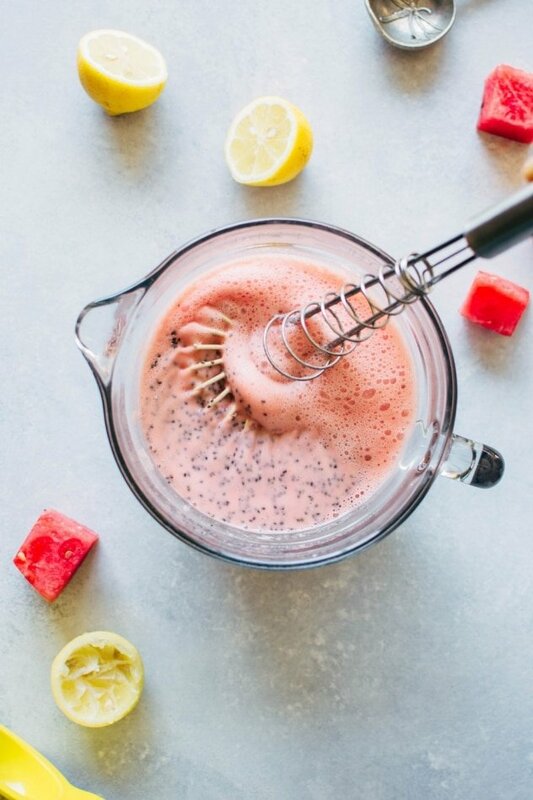 Blend watermelon, yogurt, lemon juice, sea salt and maple syrup in blender until smooth. You want about 2 cups of liquid once watermelon and yogurt are blended. If short add a little more watermelon and blend again. Pour into a large jar or sealable container and whisk in chia seeds. Store in the refrigerator for several hours, or overnight, until chia seeds are hydrated and pudding is thick! Serve topped with berries and more watermelon. 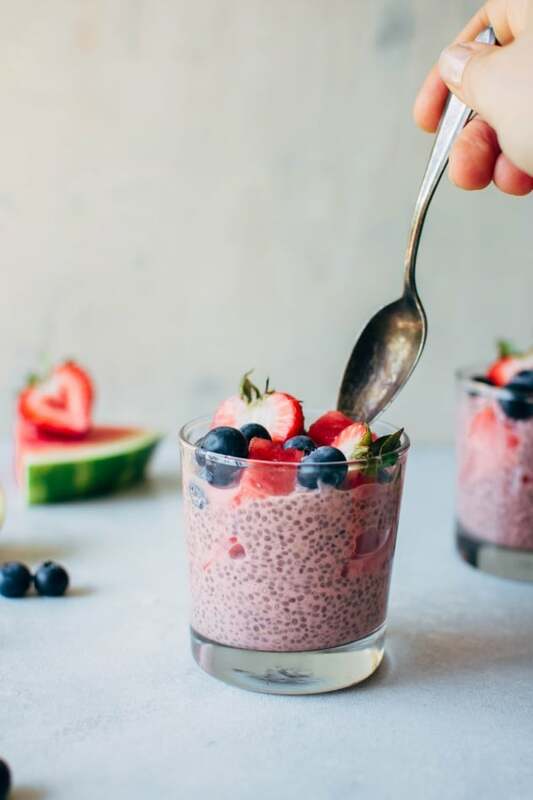 This entry was posted in breakfast, snacks and tagged berries, breakfast, brunch, chia pudding, chia seed pudding, chia seeds, dessert, easy, gluten free, grain free, healthy, pudding, quick, snack, vegan, watermelon on August 2, 2017 by Nyssa Tanner.